Happy Sweet Shoppe Saturday everyone! Are you ready for some NEW goodies? 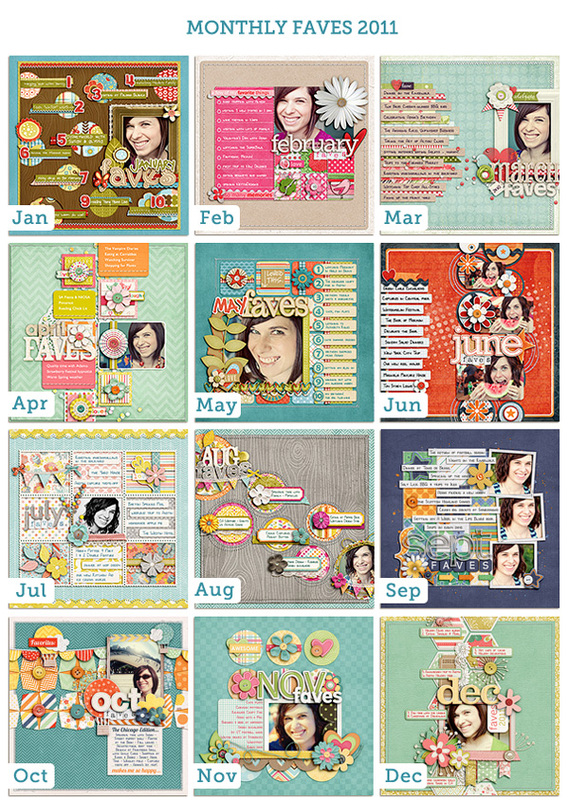 This week’s release heralds month number TEN of one of my absolute FAVE (pun-intended) scrapbooking projects: the Monthly Faves! Can you believe we’re down to the final quarter of the year already? I’ve done my Monthly Faves project twice before, once in 2009 & again in 2011, and I love it so much I’m doing it again here in 2013. I can’t even tell you how much fun it is to look back on those layouts and see what’s changed and what’s stayed the same. It’s like a mini time-capsule of your favorite things from way-back-when. And this year I wanted to make it even easier for you to creatively capture your faves. So on the last(ish) Saturday of every month, I’ll be releasing that month’s Faves layout as a new Sweet Single template. Which should give you plenty of time to capture your Faves for that month before the new month arrives. 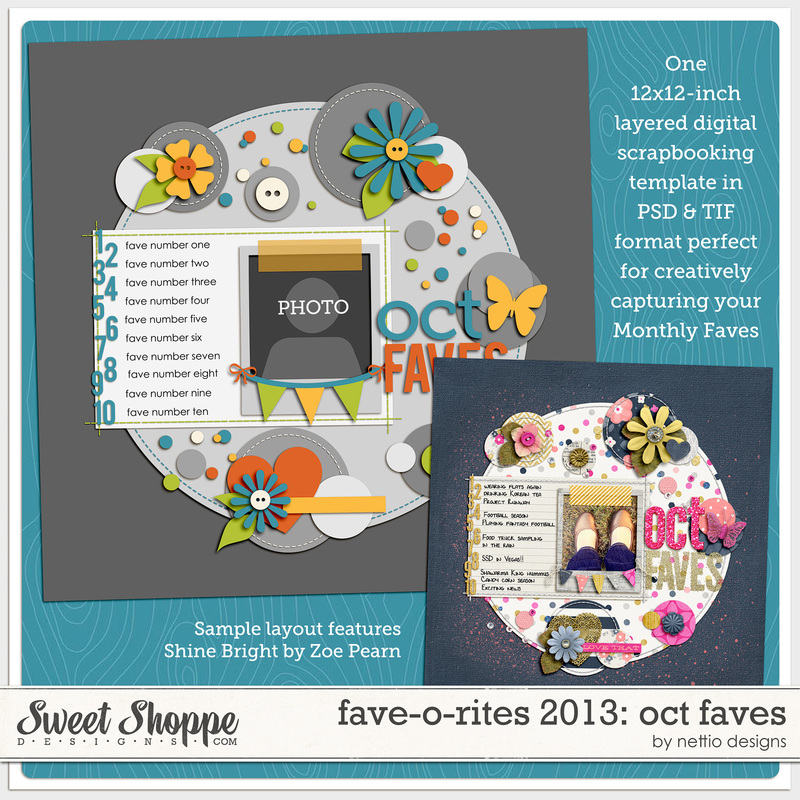 This week’s release is the tenth FAVE-O-RITES Sweet Single digital scrapbooking template of the year, FAVE-O-RITES 2013: October Faves. 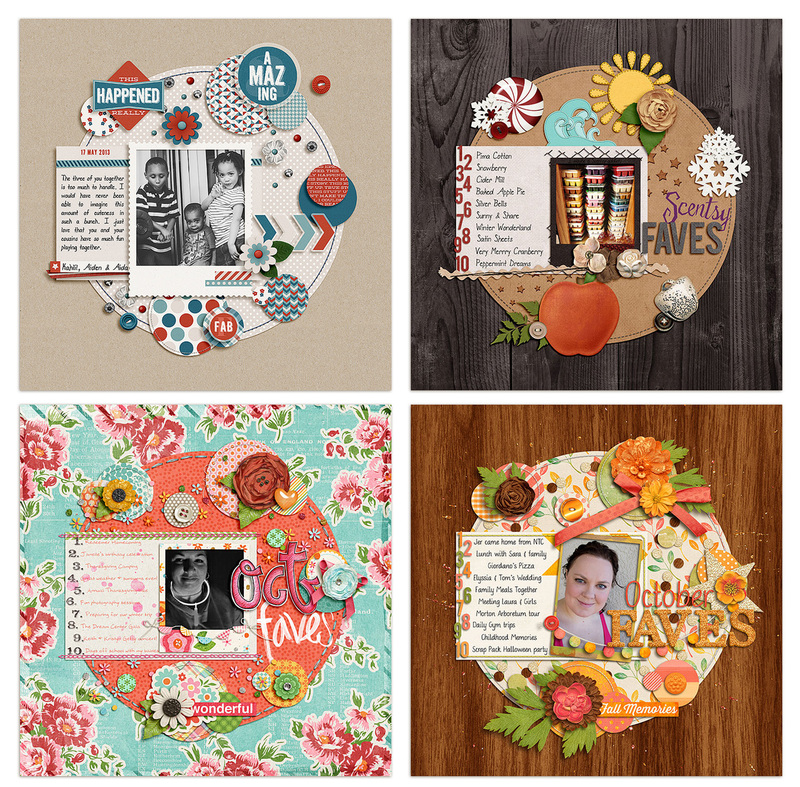 I’ve been digging circles lately so I hope you love this circ-tacular design as much as do! 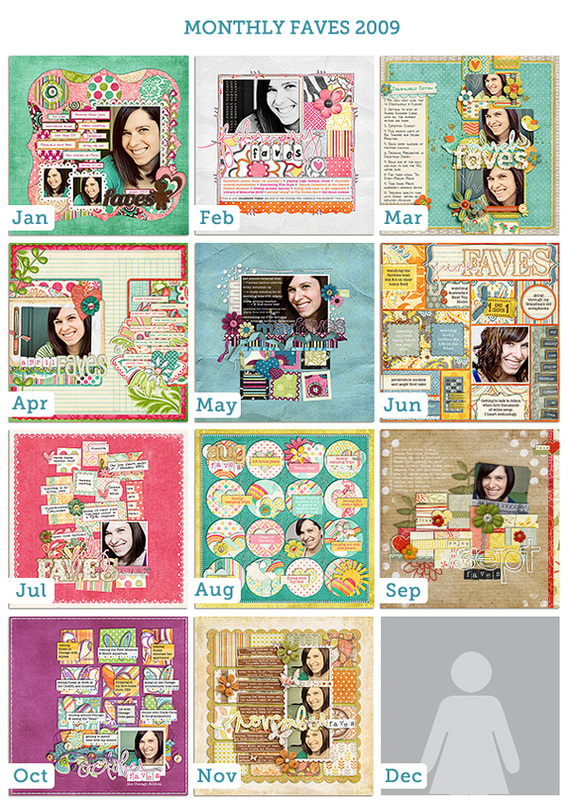 Here’s a bigger look at my 2013 October Faves layout that inspired this template. As you can see, my faves list is super random, which is exactly what I love! It’s not something you have to stress out over: make a list of 10 things, scrap it and boom, you’ve captured an easy snapshot of YOU in your scrapbooks. Just think how much fun it’ll be for you or your kids & grandkids to look back on one day! And of course, as with every Sweet Shoppe Saturday, you can save 20% off all new releases thru Saturday. 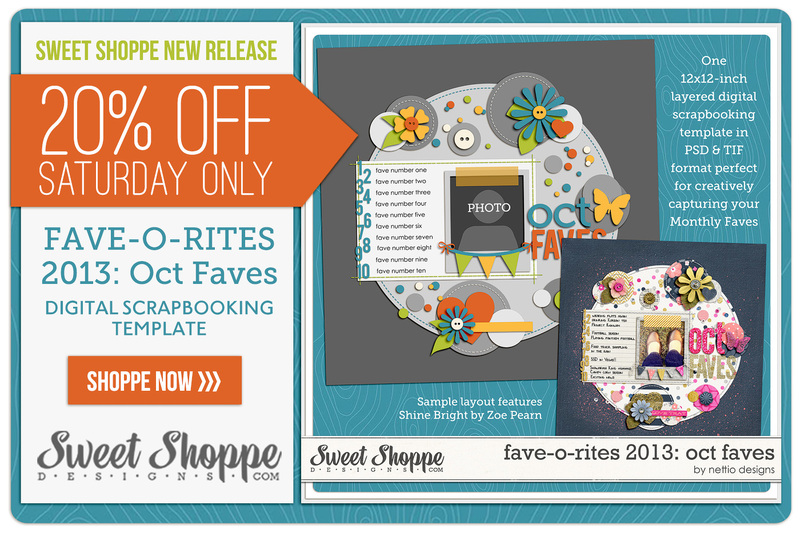 Pick up FAVE-O-RITES 2013: October Faves here today! Well, that’s it from me today! 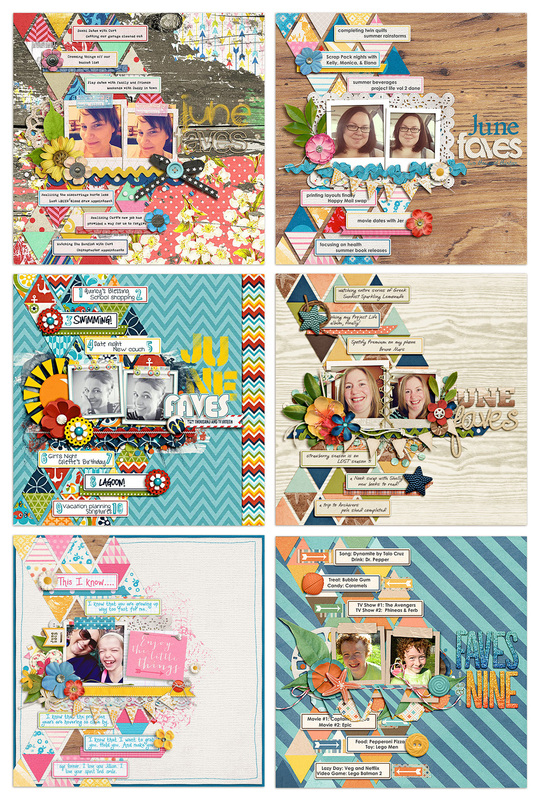 I’ll be back next week for one of our biggest holidays of the year, Digital Scrapbooking Day! See you then! Happy Sweet Shoppe Saturday everyone! 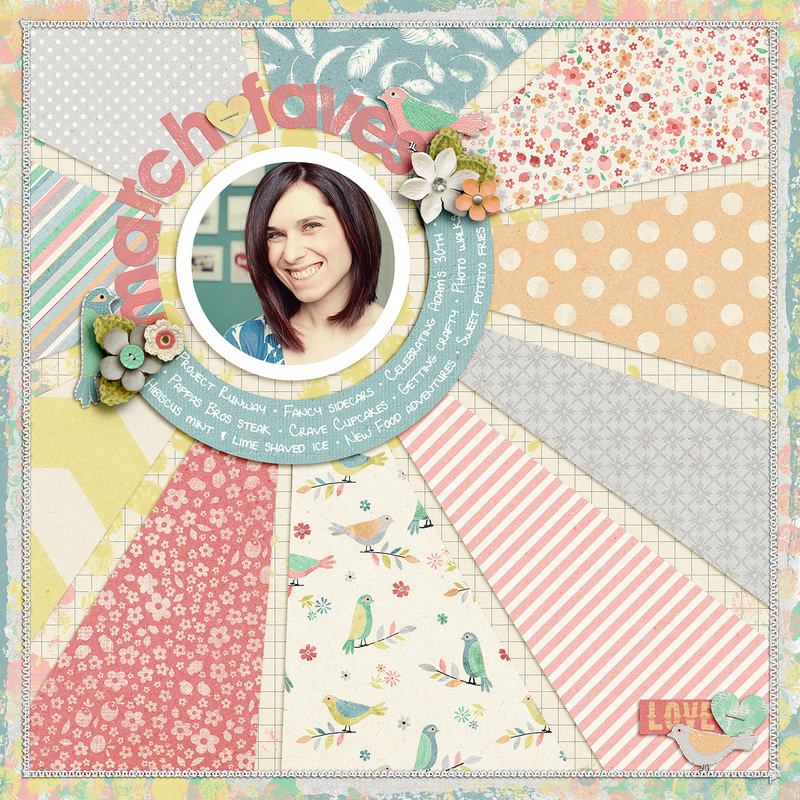 This week’s release heralds month number six of one of my absolute FAVE (pun-intended) scrapbooking projects: the Monthly Faves! Can you believe we’re halfway through the year already? 2013 is flying by! And this year I wanted to make it even easier for you to creatively capture your faves. 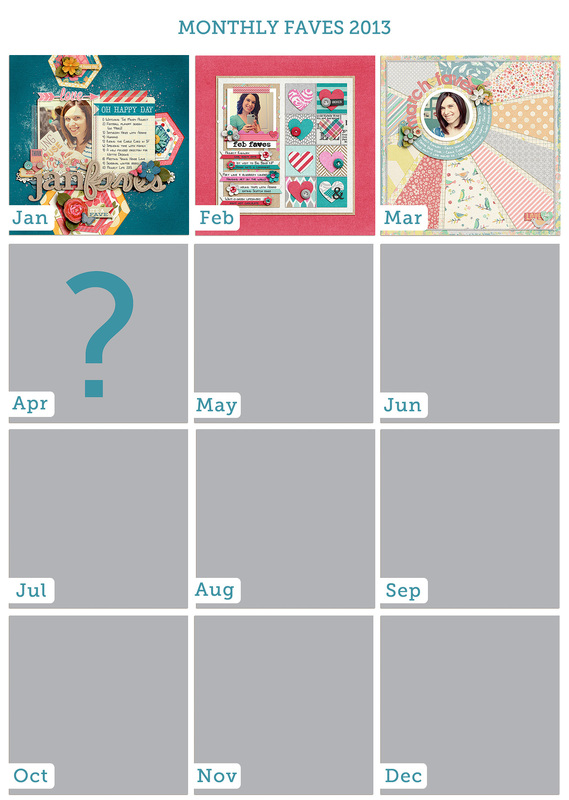 So on the last(ish) Saturday of every month, I’m releasing that month’s Faves layout as a new Sweet Single template. Which should give you plenty of time to capture your Faves for that month before the new month arrives. 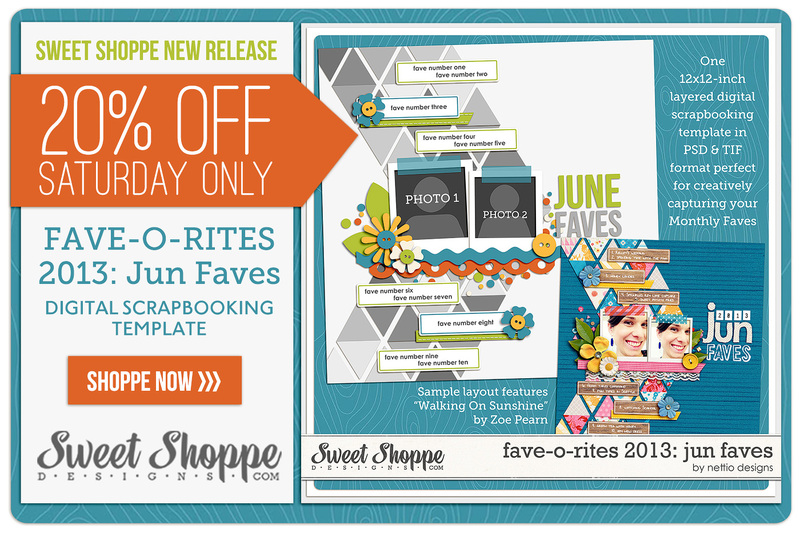 This week’s release is the sixth FAVE-O-RITES Sweet Single digital scrapbooking template of the year, FAVE-O-RITES 2013: Jun Faves. It features room for two photos of your lovely smiling face, your top 10 faves for this month and a bold triangle paper-lovin’ design. Is it just me or are triangles everywhere lately? I don’t know about you, but I’m totally lovin’ them! I’m calling it now: triangles are the new hexagon, which was the new chevron. You heard it here first, folks. 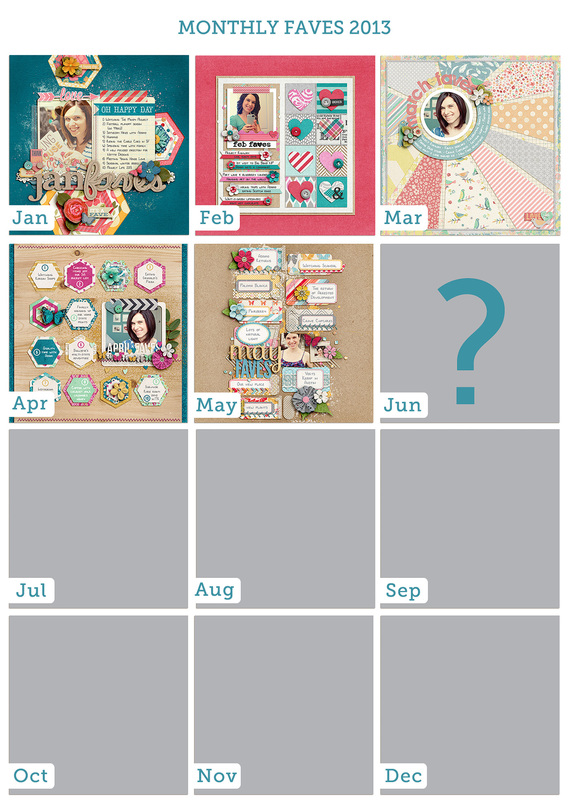 Here’s a bigger look at my 2013 Jun Faves layout that inspired this template. As you can see, my faves list is super random, which is exactly what I love! It’s not something you have to stress out over: make a list of 10 things, scrap it and boom, you’ve captured an easy snapshot of YOU in your scrapbooks. Just think how much fun it’ll be for you or your kids & grandkids to look back on one day! 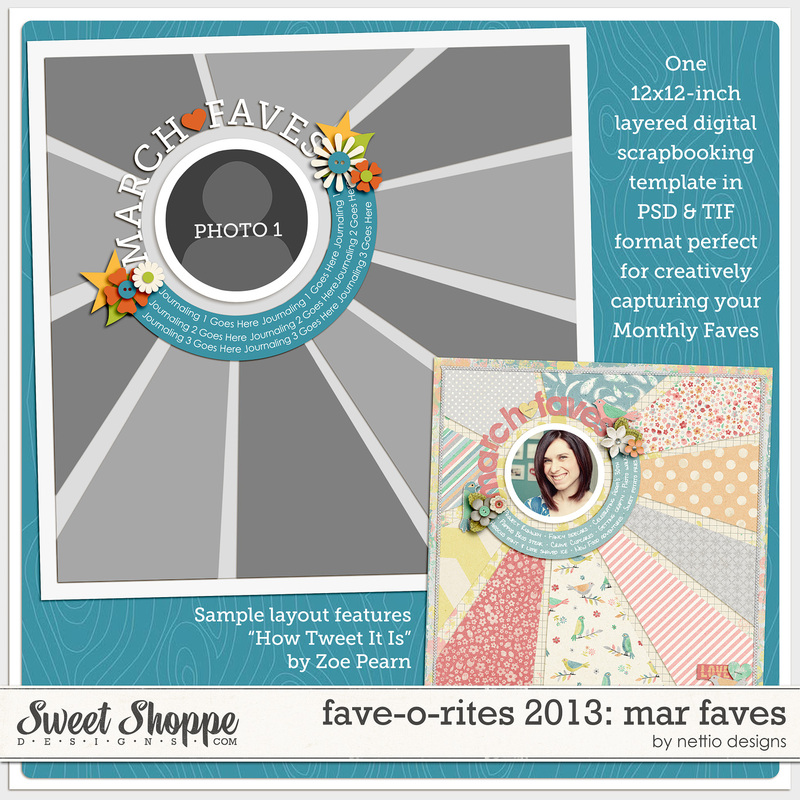 Pick up FAVE-O-RITES 2013: Jun Faves here today! Also one final reminder, don’t forget to sign up for the free Summer Love Mini Course if you haven’t yet! I’ve already shared two posts but we’re just getting started and Team Awesome and I would love to have you join us! 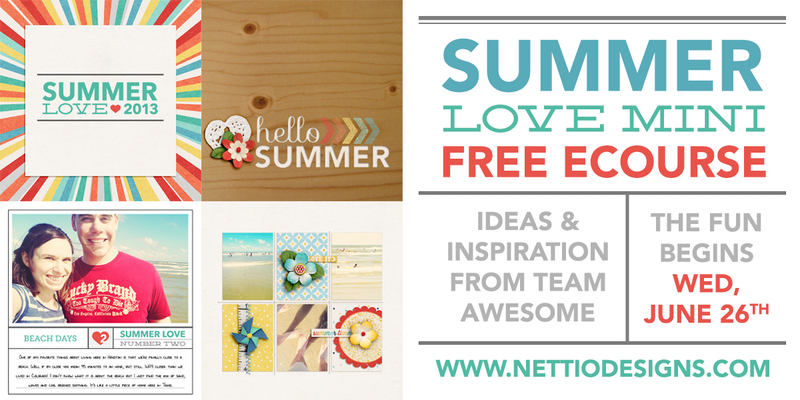 More details can be found here or sign up here to receive free Summer Love email updates. Well, that’s it from me today! Have a great weekend everyone and if you’re unlucky enough to be caught in the heatwave, try not to melt too much! 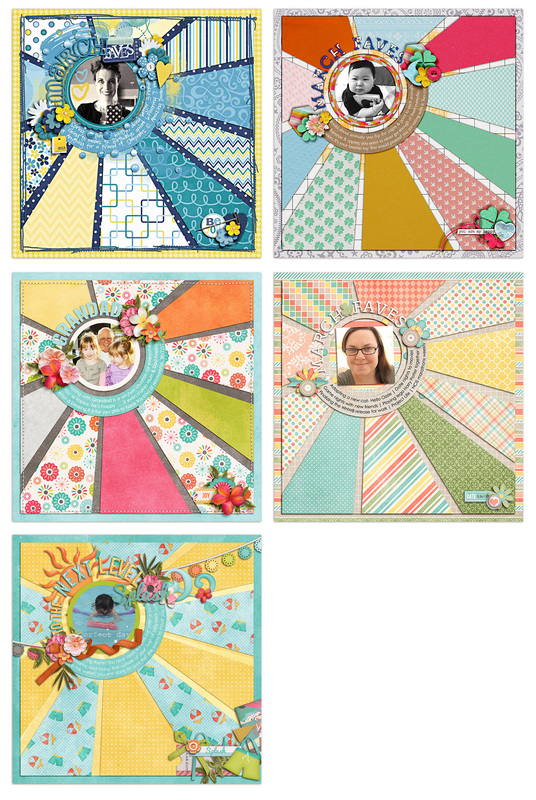 New Release | April Faves & Your Chance to Join Team Awesome! And this year I want to make it even easier for you to creatively capture your faves. So on the last(ish) Saturday of every month, I’ll be releasing that month’s Faves layout as a new Sweet Single template. Which should give you plenty of time to capture your Faves for that month before the new month arrives. 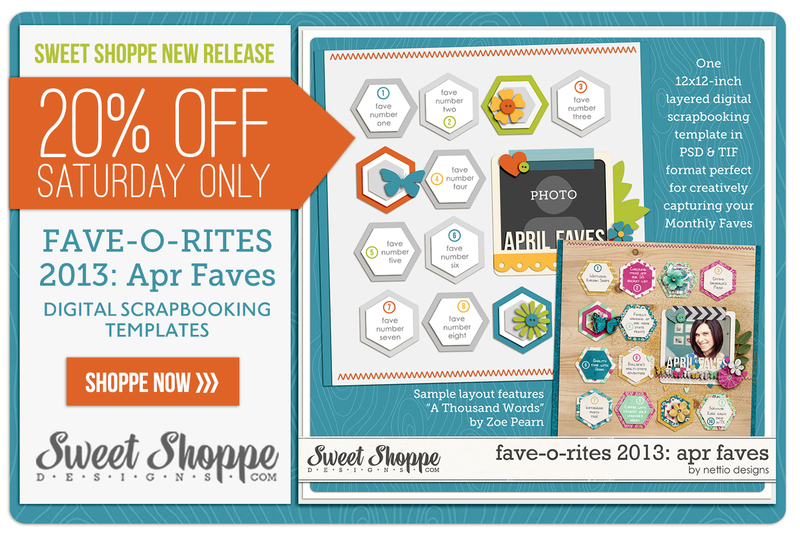 This week’s release is the fourth FAVE-O-RITES Sweet Single digital scrapbooking template of the year, FAVE-O-RITES 2013: April Faves. 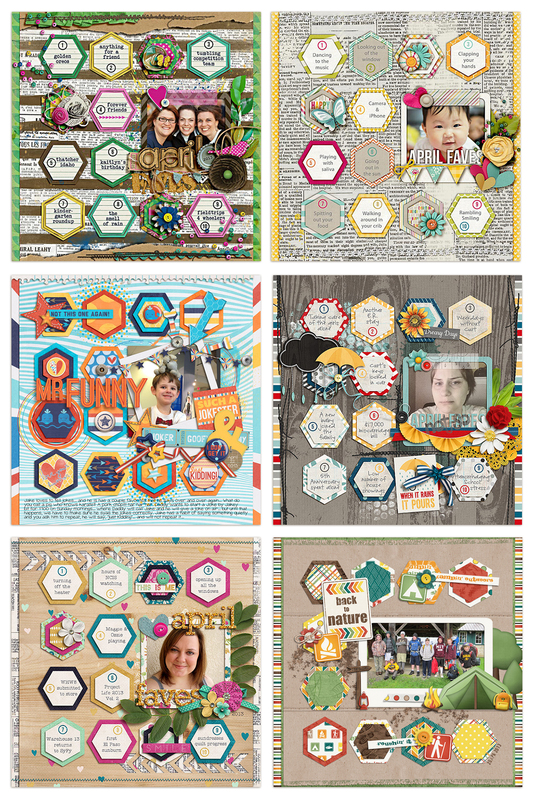 It features room for one photo of your lovely smiling face, your top 10 faves for this month and a bold patterned paper-lovin’ hexagon-shaped design. 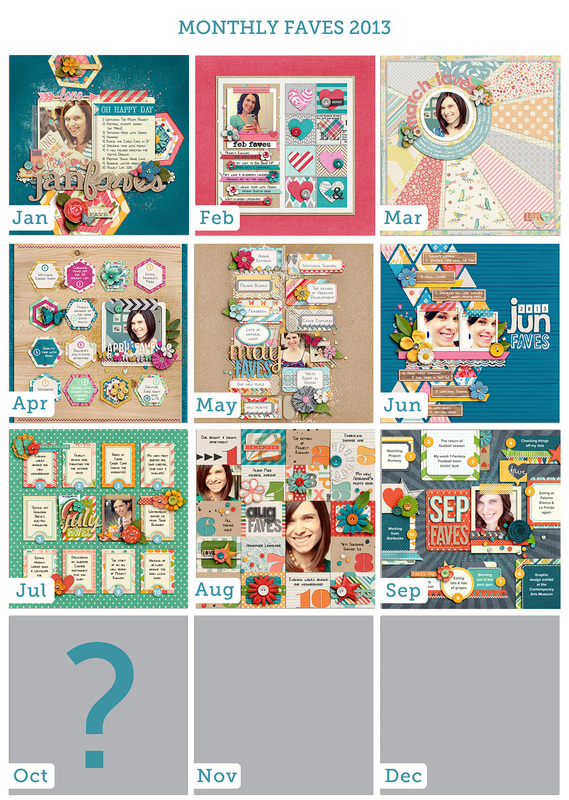 Here’s a bigger look at my 2013 April Faves layout that inspired this template. As you can see, my faves list is super random, which is exactly what I love! It’s not something you have to stress out over: make a list of 10 things, scrap it and boom, you’ve captured an easy snapshot of YOU in your scrapbooks. Just think how much fun it’ll be for you or your kids & grandkids to look back on one day! 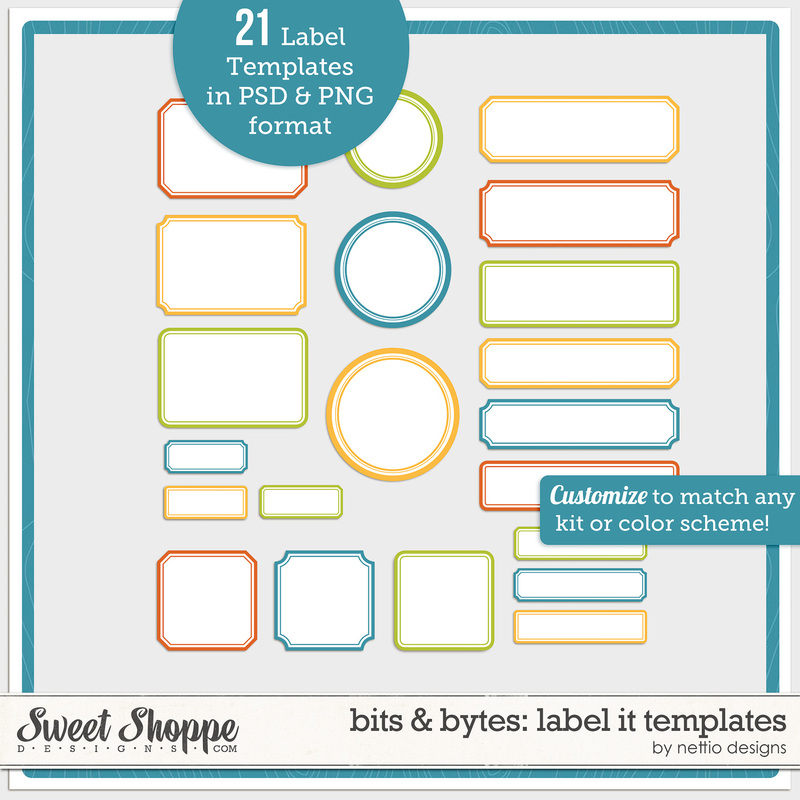 Also coming to the Shoppe this weekend is my Free With Purchase from last weekend, the Bits & Bytes: Label It Templates. 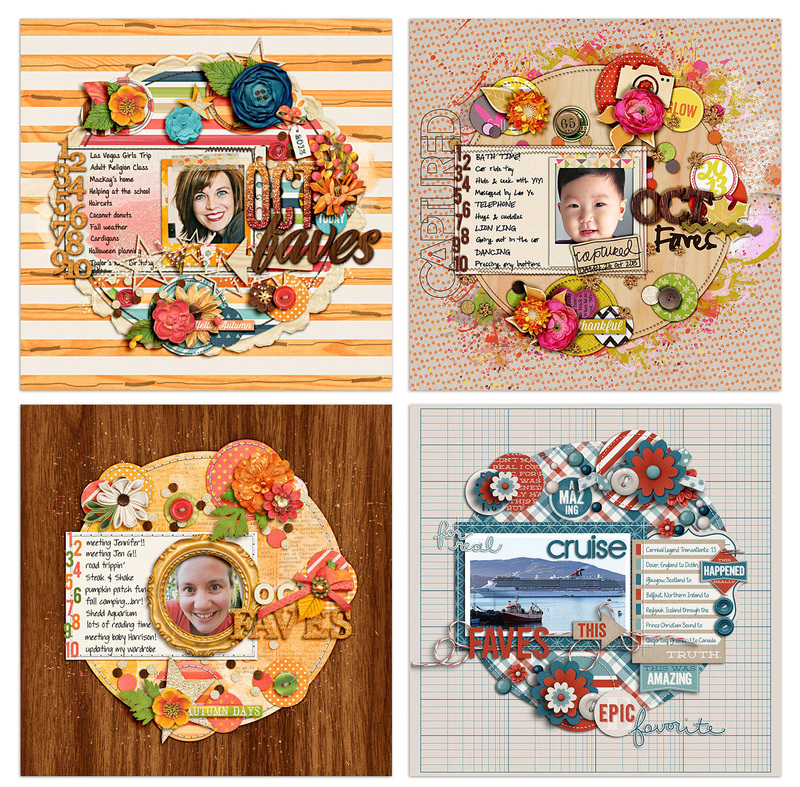 Make your own labels to match any kit or color scheme! 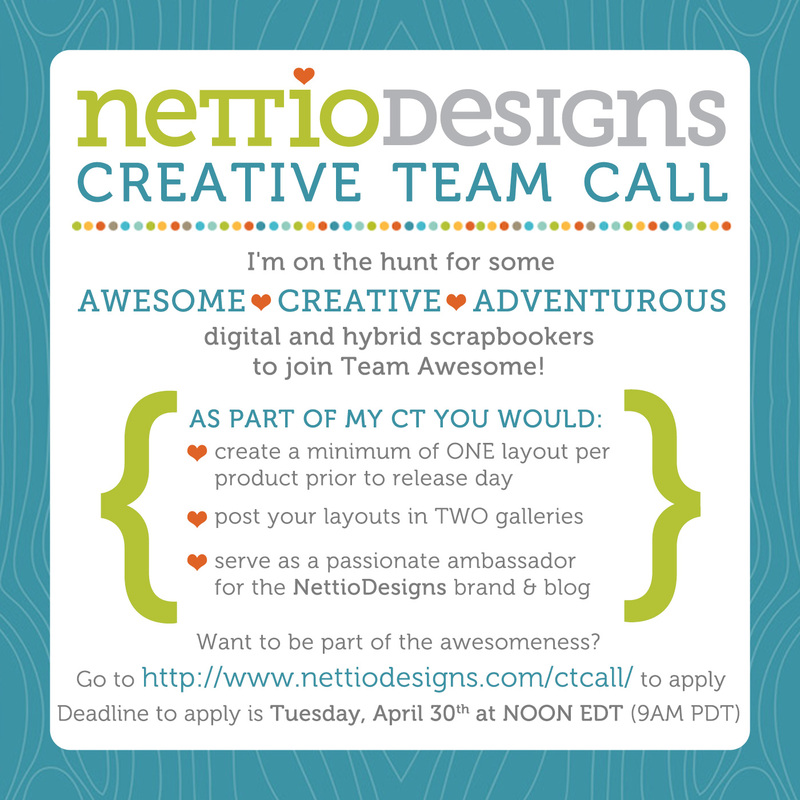 And finally my last bit of news this week, in case you missed the announcement on Wednesday, is I’m looking for some awesome new digital or hybrid scrapbookers to join Team Awesome! This is only the second call I’ve held…ever, so it’s pretty safe this is an opportunity that doesn’t come around too often. If you think you’ve got what it takes to be part of my awesome team of ladies, just go to this link below to apply! Applications are due Tuesday, April 30th at NOON Eastern. I can’t wait to see who’ll be joining us! 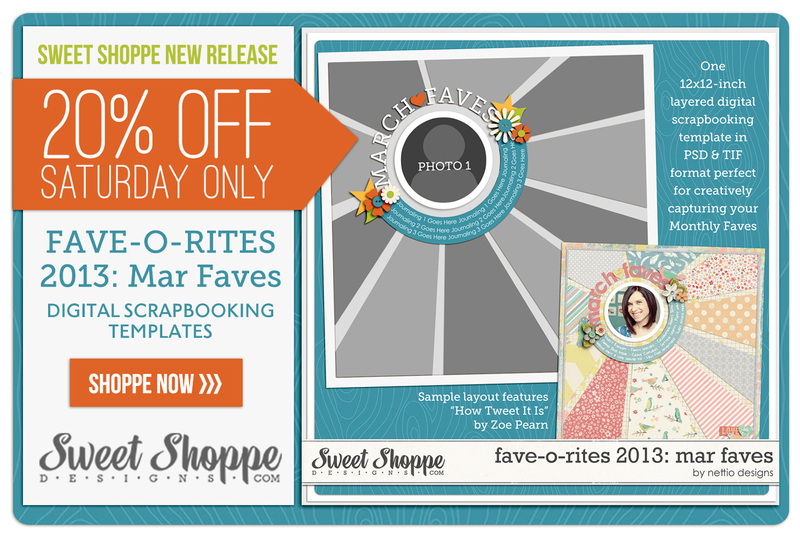 Pick up FAVE-O-RITES 2013: April Faves here today! 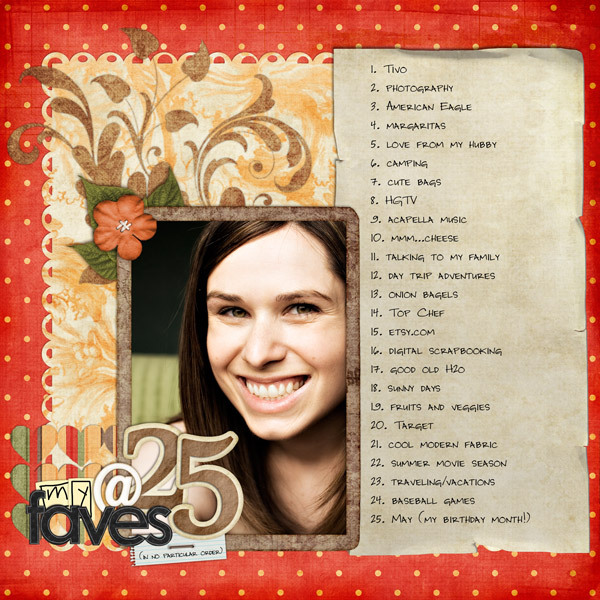 Woohoo to the hoo, it’s time for the Monthly Faves: 2013 Edition! I’ve come to the conclusion that my Monthly Faves layouts are an every-other-year project for me. I first did them in 2009, then again in 2011 and here I am hopping on the Faves train once more in 2013. It seems to be just the right amount of time for me to get excited creatively about the project again while not being so far apart that you can’t see connections between the faves on the layouts. 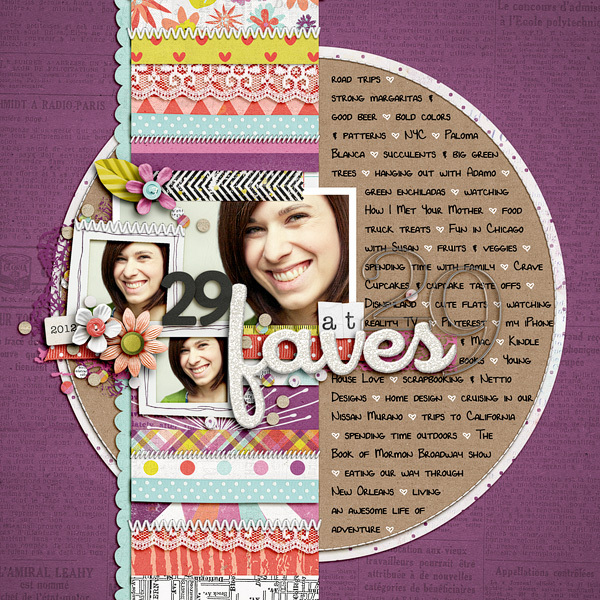 For those new to the Faves, my Monthly Faves project is a year-long scrapbooking layout project where each month you scrapbook one layout documenting your top ten favorite things from that month. Because it’s the easiest All About Me page journaling you’ll ever do. 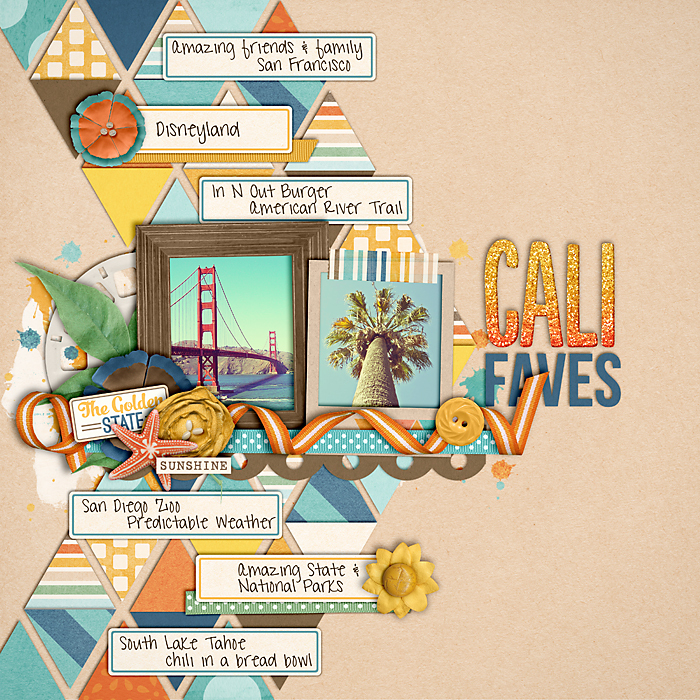 Because designing scrapbooking layouts based around lists is FUN. Because it captures an easy snapshot of your life at that moment. Plus it’s fun to look back at all the layouts and see what’s changed/stayed the same. Because you don’t remember nearly as much stuff as you think you will. Seriously, I look back at the layouts and am constantly reminded in an “oh YEAH!” kind of way. Easy right? Well for those of you looking to play along with me this year, I’ll be making it even easier for you as this year I will be releasing my Monthly Faves as a single templates on the Saturday before the last week of every month to give you plenty of time to scrap your own Faves layout. This Saturday I’ll be releasing the January Faves 2013 Single at Sweet Shoppe Designs so keep an eye out for that. Woohoo to the Faves! Anyone else done a Monthly Faves project before? Anyone want to play along with me this year? I’ll be doing it either way but it’s so much more fun with friends. Ask Nettio: How Do You Remember Your Faves? You can also find all my Faves-related posts here. If you received the Nettio Designs newsletter over the weekend or saw my Sweet Shoppe Saturday blog post this week, you may have seen a little comment about this week being my “eek, I’m officially turning the big 3-0!” birthday week! Well, I’m turning 30 on Thursday, May 24th to be exact. Which means I still have a few days left before I’m officially a tech-lovin’ gal in her thirties. Eek, scary! I admit, I’m not totally sure how I feel about it just yet, haha, but hey, the show must go on, right? So in celebration, I thought it was only fitting to spend a day or two saying goodbye to my twenties and what better way to remember birthday year 29 than with a Faves list? Anyone else ever done an age-inspired layout to celebrate a birthday? I have to say I love looking back at these layouts because it’s so fun to see what changes (so many of the 28 ones are Colorado specific!) and what stays the same (fresh fruit and veggies – woohoo for healthy eating! ).